Master Scourge is the Wormwood’s boatswain and masterat- arms, and Mr. Plugg’s right-hand man. As boatswain, he is in charge of all activities and sailors on deck, and as master-at-arms, he is responsible for discipline. Master Scourge is a sneering man with a braided beard and a mouth full of gold teeth. His body is tall and thin, and even his long coat and heavy boots fail to give any impression of strength or bulk. A sadistic coward, Scourge uses his association with Plugg as protection and in return has no morals when it comes to the tasks his master sets. He is bold and violent when the odds are stacked in his favor, happily kicking a dying dog in the street if asked to do so. But should that dog get up and bite, he quickly flees. Master Scourge is a key villain in the early part of the adventure, and his whispered words further poison Mr. Plugg against the PCs. Scourge’s relationship with the PCs is a crucial one. He immediately senses something out of the ordinary about them, and his dreams of rank and fortune soon begin to unravel. Like most bullies, Scourge is a coward at heart, and sets out to discredit and ultimately kill his rivals. This enmity is personal, and primarily directed at a single PC, though how this manifests is ultimately up to you. Scourge was recently rejected by Sandara Quinn (see page 56), and any object of her affections is sure to earn his jealousy and hatred. Likewise, Scourge might be jealous of a handsome and talented PC and fear for his own position on the ship. While Scourge focuses his hostility on one PC, he is also happy to intimidate and victimize the other PCs, as well as seeking to discredit the PCs’ friends. He avoids the PCs as a group, however, and immediately goes to Plugg’s side if threatened. If actually attacked, he also goes to Plugg, who may have the PCs disciplined. Playing the bully requires you to temper the PCs’ anger while ensuring they recognize Scourge as a deadly enemy with far too many allies to simply be killed. Terrified as he is of Harrigan and having no desire to be keelhauled, Scourge won’t try to kill the PCs—at least, not at first. 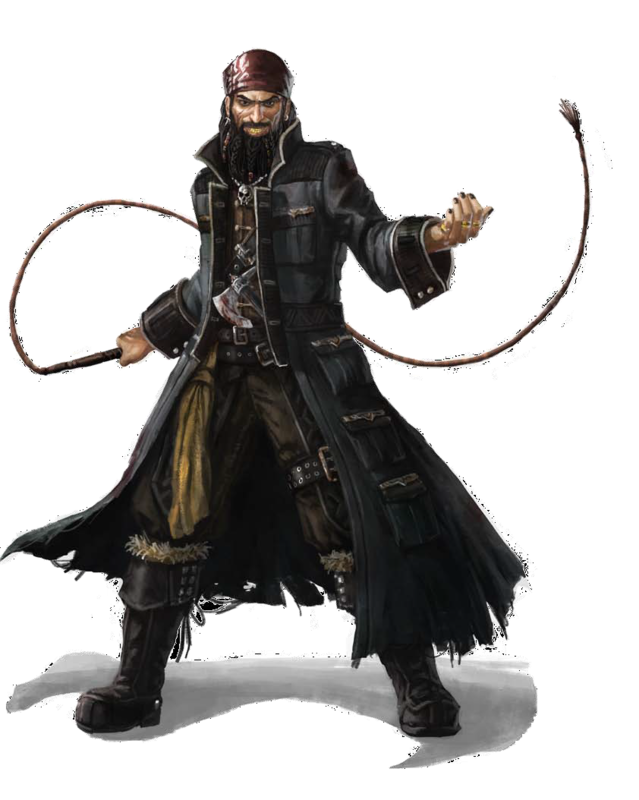 Instead, he seeks to poison the other crew members against the PCs, and is likely to succeed with his own small band of admirers, whom the PCs will find hard to convert. In essence, this group becomes a rival adventuring party, but with one crucial difference: these rivals also enjoy the support of Mr. Plugg. It’s not until events move on to the Man’s Promise in Part Two that Plugg and Scourge decide to have done with the PCs, but they’ll eventually get their comeuppance at the hands of the PCs in Part Three. During Combat Scourge prefers intimidating opponents to fighting them. Once in combat, he attempts to attack from behind, flanking with his allies. Morale If reduced to 10 hit points or fewer, Scourge flees and tries to make good his escape. A man who bears a grudge, Scourge is certain to try to slip dark reaver powder or oil of taggit into the meal or drink of anyone who humiliates or injures him when the chance comes.